*Calf Strap is sold separately. This hand-molded, premium saddle leather ankle holster by Galco offers extended comfort with a wide neoprene ankle band and VELCRO® closure. Additional comfort is added to this ankle holster by providing sheepskin padding between the holster and ankle. This ankle holster also features a reinforced thumb break. If you want a high quality ankle holster that is built to last then the Galco Ankle Glove is the way to go. NOTE: Some weapon fits do not come with a thumb break if the configuration of the weapon will not allow for it. AG158/159 is an open top design with tension unit. AG160/161 has a thumb break retention strap. The Galco ankle glove is the best ankle holster out there this is my second one. I wasn't sure how I would like an ankle holster, but after wearing it for a few weeks, I LOVE it. Can't even tell it's there. Great quality. Excellent product very comfortable right from the start. If you have boots you will need a boot extender for it. Very pleased. The Galco Ankle Holster is a great fit for me. I am able to carry my weapon concealed with comfort and ease. I have worn one of these for my G27 as a backup on duty for over 9 years and never a problem. Velcro is finally getting worn out some and I may need to get a new one. Ordered one for my favorite sheepdog and he loved it. I'll be ordering one for myself soon. We both were using something similar for our backup but this is far better quality. Great fit and feel, the lining has good feeling. It does leave an odd off color rub off on my gun. If you have larger legs it can be difficult to situate. Blown away at how comfortable this holster is. I am new to carrying on the ankle and it was only a matter of a week before i barely notice it is there. no rubbing, no movement. Excellent design IMO. I am 5'8, 160 lbs and it fits my ankle perfectly. Excellent product. It is very well made and should hold up for an extended time. The soft backing (wool maybe) makes this very comfortable to wear for long stretches of time. The reason for only four stars is that this holster is somewhat bulky making it a bit difficult to wear with my jeans or other pants that are more tight fitting. But without the bulkiness you'd sacrifice comfort. I'll go with the comfort. Very comfortable, gun fit the holster well. I found that I wear it just above shoe height, under my calf for maximum concealment. Thus far, haven't head any issues, except on one corner the comfort fabric was separating from the foam, so I glued that back. I can wear my Kahr PM9 under my Wrangler jeans almost unnoticeable. So far I haven't needed to use the optional calf strap. Wore one for years for my off-duty Glock 27 - now that I'm retired I like this one even better. Best Ankle Holster on market. Exactly what I ordered, was not in stock elsewhere. 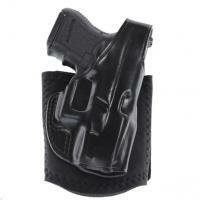 These holsters are fantastic I carry a G26 in mine for at least 10 hours a day, absolutely 0 problems after the first year I even tried running, and it just barely jiggled. I cannot carry iwb at work due to bs company policy, but I'll be damned if I don't have my baby glock with me I have super skinny legs and there is still plenty of adjustment in the elastic band for someone who has larger legs Glaco knocked it out of the park on this one. I hope they keep making it long into the future I just ordered the ankle safe to carry a spare mag and my fox labs mean green spray Come and take it. Ankle Glove for Glock 42 is AWESOME. Hands down, the best ankle holster I have worn. Took my dog for a brisk 4 mile walk this morning - didn't move a millimeter. Now I'm at the office in a suit - completely concealed and no worries of scaring off my liberal friends with an IWB carry when I take my suit jacket off, Thanks Galco. Had one for a G26. Used it for almost 10 years and loved it. When I got a G42, there was no question in my mind about what kind of ankle holster I wanted for it. I was not let down. Most secure and comfortable ankle holster there is. Great fit and comfort. Top quality.